So much to do, so little time. 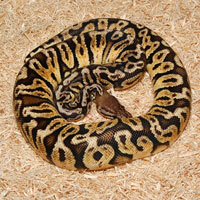 Kevin McCurly has been making some of the awesomest Ball Python creations with the Hidden Gene Woma mutation. One of the common misconceptions about this mutation is that there is another gene hidden in the mutation. There really isn't, but when Kevin first starting producing them, he thought there was something else acting on the gene. Kevin actually had two genes that were very similar and he called both of them Womas. 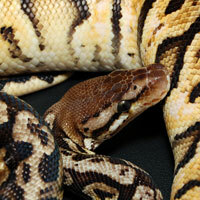 This mutation is completely different from the other Womas (they can be seen on our collection page). 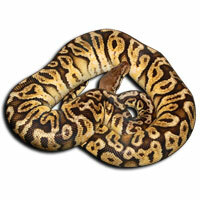 This one got coined Hidden Gene Woma as a distinguisher for the two seperate genes. I hope I didn't confuse anyone with that. We got our foundation male directly from Kevin in 2010, and wanted to cram a few more genes in there when we got it, so we got a Lemon Pastel version as well as some Granite sprinkled in. 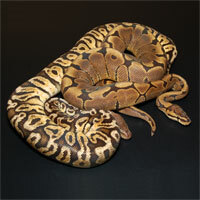 We can't wait to start breeding this guy, and hope to make Infernos, Red Spectrums , Soul Suckers, etc., etc. in the future. This gene is still fairly in it's infancy, and there is much to do with. We are very excited to be working with it.